Low Battery Summer singles “Moneys” and “Work Hard,” which debuted via VIBE and Pigeons & Planes, respectively, have found Casper & B. fusing elements of electronic, pop, and hip-hop into their own vibrant sound. Earlier this month, GoodMusicAllDay premiered “Leave Me Alone,” a maximalist, energetic, and infectious dance track featuring Wes Period and OG Swaggerdick, and prior to that Mass Appeal shared “New Phone Who Dis,” a LiteFeet party anthem featuring Pell, which The Smoking Section asserted, “will be played in clubs and people will go crazy for it.” Casper & B.’s Low Battery Summer is now available. Please contact Michelle or Rory if interested in talking with Casper & B.
LA-based producers Casper & B. expertly balance rap, dance, and pop strictly on their terms. Mixing Pete Rock and Madlib fundamentals with nuances of hyphy, go-go, Lite Feet, New Orleans bounce, and marching band sounds, the two have taken their experiences working professionally in both hip-hop and pop to create a hybrid sound of their own. 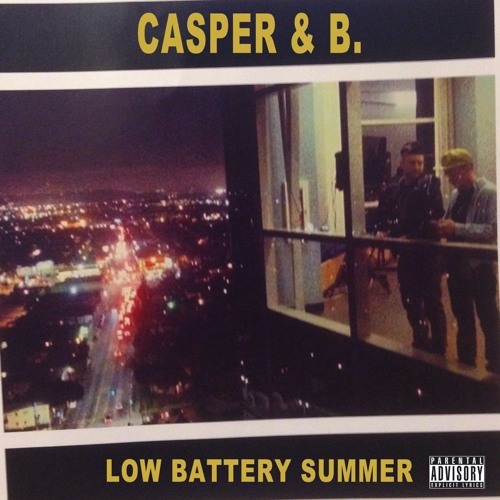 Their upcoming debut project, Low Battery Summer, which features Pell, Charles Hamilton, Michael Christmas, Marc E. Bassy, and more, demonstrates how Casper and B. expertly flip pop and classical sensibilities on their head, blunted with bass drops and breakdowns. Low Battery Summer is aimed for release on June 20th.